A Reuters news article this week stated that, “Frustration is building across farm country at what feels like a never-ending season of bad news.” And an update from the Federal Reserve Bank of Minneapolis recently noted that, “Farmers are dealing with a host of compounding problems.” As spring planting in the Corn Belt approaches, today’s update looks at recent news items that shed light on the condition of the agricultural economy. 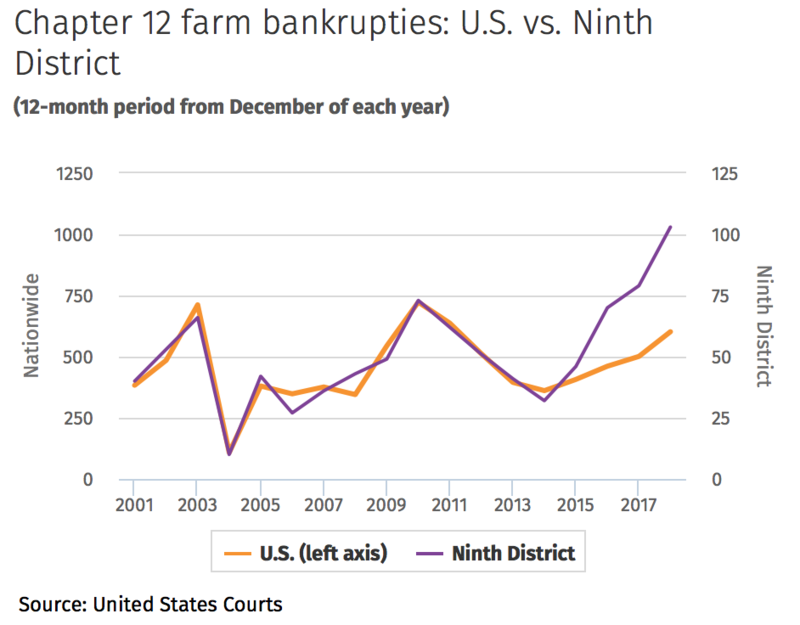 An update last week from the Federal Reserve Bank of Minneapolis (“Farmers heading to fields hoping for better days,” by Ronald A. Wirtz) stated that, “The Ninth District’s farm economy might generously be described as struggling to tread water. 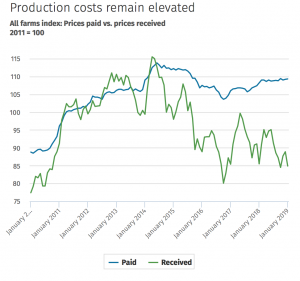 The blame for this is mostly low prices, which have fallen significantly from high levels generally seen from 2011 to 2013, and longer for some commodities. But it’s also only part of the story. While prices are significantly lower than they were earlier this decade, many commodity prices are above those seen in the previous decade. Corn, for example, averaged about $3.50 a bushel in 2018; it was below $2 for a period in the early 2000s. But farmers are dealing with a host of compounding problems, including production costs that have remained stubbornly and usually high. “Farmers heading to fields hoping for better days,” by Ronald A. Wirtz. fedgazette- Federal Reserver Bank of Minneapolis (March 22, 2019). Mr. Wirtz explained that, “Farmers are also a victim of their own success. High yields in recent years have created record or near-record harvests in many commodities, and demand has not increased in kind. Tariffs have also created some trade-induced interruptions in international demand for U.S. commodities. Data from the U.S. Department of Agriculture show soybean exports to China since September are down by more than 80 percent. The Fed update noted, “Not surprisingly, another year of low prices is compounding stress among farmers. 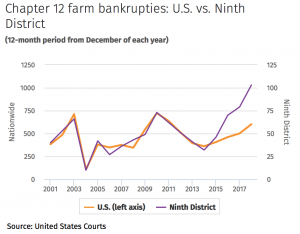 For example, chapter 12 bankruptcies in the Ninth District have increased steeply since 2014, and much more so than in the nation as a whole. 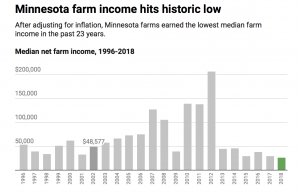 Meanwhile, Adam Belz reported on the front page of Tuesday’s Minneapolis Star Tribune that, “The trade war and bad spring weather hit Minnesota farmers while they were already down in 2018, leaving them with their least profitable year in three decades. 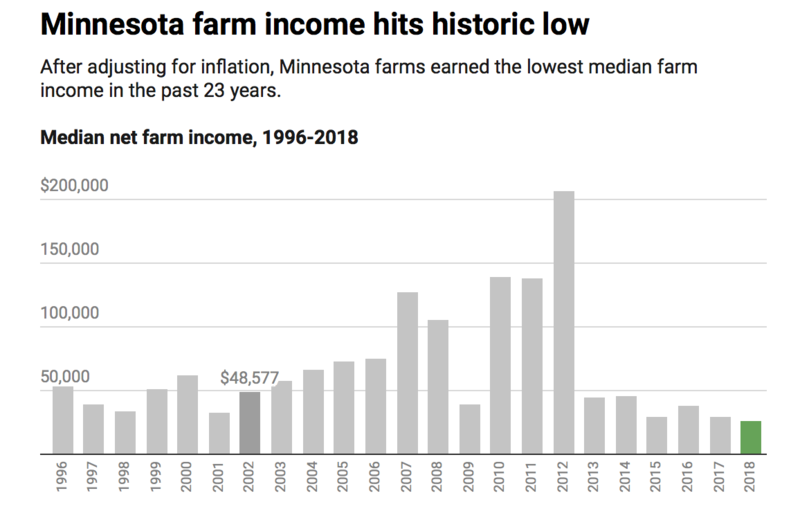 “Farm income in Minnesota fell 8 percent last year, worst year since early 1980s,” by Adam Betz. Minneapolis Star Tribune (March 25, 2019). Pamuk and Huffstutter indicated that, “Soybean exports to China hit a four-year low in February because of the trade war. China is the biggest buyer of U.S. soybeans, which are the largest single U.S. agricultural export. A near halt in exports has hit a rural economy already struggling after years of oversupply cut farm incomes by 50 percent in the past five years. In other developments, Bloomberg News reported Tuesday that, “China may increase U.S. pork imports to a record this year as part of a commitment to bolster purchases of American farm goods to resolve the trade war, according to people familiar with the situation. 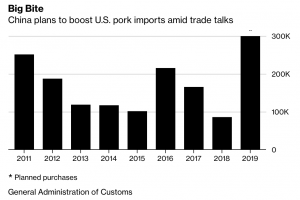 “China Plans Record U.S. Pork Imports to Resolve Trade War,” Bloomberg News (March 25, 2019). The article noted that, “The final volume will depend on the outbreak of African swine fever in China, according to one of the people. The disease, which is fatal to pigs and is proving hard to contain, has been devastating hog production since it was first reported in August. It’s already slashed the sow-breeding herd in the world’s No. 1 pork market by 15 percent. Tuesday’s article stated that, “The estimate for China’s imports may be ‘quite conservative,’ given the losses from the swine flu outbreak and the Asian nation’s appetite for pork, Rich Nelson, chief strategist at Allendale Inc. in McHenry, Illinois, said in a telephone interview.